William Frederick Houlihan, age 22. William “Bill” Houlihan was born December 11, 1918, in Boston, Massachusettes. After working as a merchant marine in 1938, he moved to Detroit, Michigan, and worked for Ford Motor Company. After the Japanese surprise attack on Pearl Harbor, Hawaii, on December 7, 1941, Bill tried to enlist in the United States (US) Navy and the US Marine Corps. Due to an ear issue he was not selected. Bill decided to go back to Detroit and wait for what he knew was inevitable. On February 14, 1942, Valentine’s Day, he received his military draft notice. After being trained as a US Army Air Force medic Bill was sent to Wendover, Utah, and became a member of the newly formed B-17 Flying Fortress 306th Bombardment Group (BG) training there. Arriving at Wendover on June 6, 1942, Private First Class (Pfc) William Houlihan was assigned to the medical component of the 367th Bomb Squadron (BS) of the 306th BG. Personnel of the 306th BG began troop movement to the US east coast from Wendover in late August of 1942. Travelling by train, ship, and air the 306th BG would travel 4,000 miles to their assigned base at Thurleigh which was five miles (8.0 kilometers) north of Bedford, Bedfordshire, England. The 306th BG flew its first combat mission on October 9, 1942, to Lille, France, to bomb the steel and locomotive works located there. Twenty-four B-17s took off from Thurleigh that day. Twenty-three B-17s returned. B-17 tail number 41-24510 flown by 367th BS pilot Captain (Capt) John W. Olson was downed when a German Focke-Wulf 190 fighter plane flew into the nose of the aircraft. Three of the nine crew members survived. It was then that the reality of war and losing friends and colleagues became part of everyday life at Thurleigh for both flying and ground personnel. 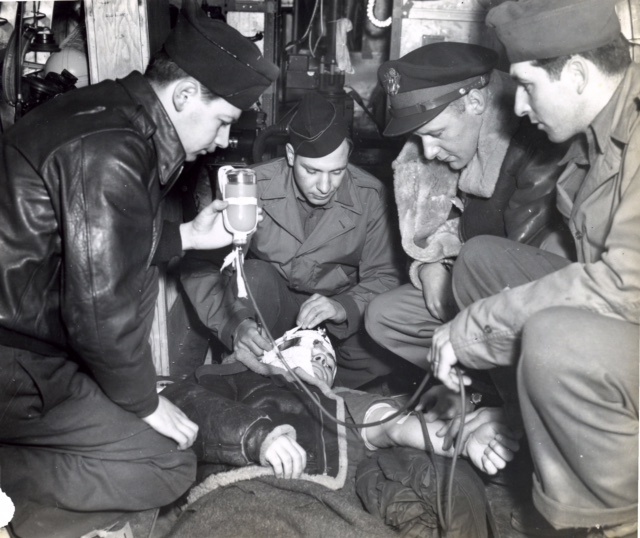 SSgt Houlihan and the 306th BG medical units manned the dispensary and hospital on Thurleigh. But focus was on the flight line as B-17s returned from a mission. Ambulances and medical personnel were at the airfield as the planes came into view and landed. Personnel on the ground counted the aircraft as they were sighted. Ground maintenance crews were there waiting to see if the B-17s they repaired and maintained came back. Friends of crew members flying that day watched to see if their buddies were returning. And the British living in the area surrounding the airfield would look to the sky and wonder if they would again see an American they had befriended as they observed the aircraft returning in formation or straggling back to Thurleigh. If there were injured or wounded on board the B-17 crew would shoot off a red flare upon approach to the airfield. Those planes were given priority landing. As that B-17 landed the ambulance would follow the aircraft and quickly move to reach the wounded airman when the aircraft came to a stop. Left to right kneeling: Captain Henry A. Danzig (423rd BS Surgeon), SSgt William F. Houlihan (367th BS Medic), Captain Charles P. McKim (369th BS Surgeon), and Sgt Clarence W. Hoheisel (367th BS Medic). The patient is Corporal James Mitchell. 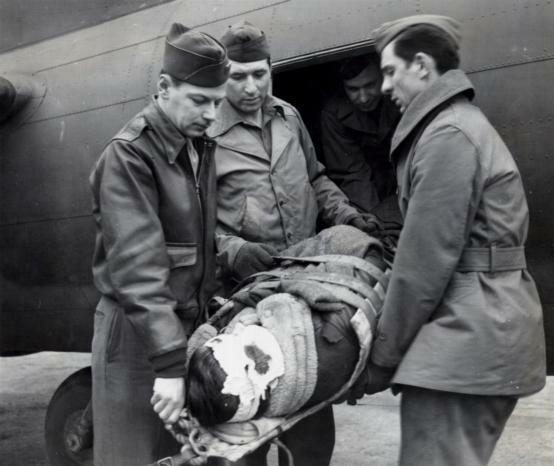 Removing a wounded or injured airman from the nose or tail of a B-17 could present a difficult problem due to limited maneuvering room for medics and a medical stretcher in the aircraft. The Americans adopted the use of a special stretcher used by the British. It was made of bamboo and would wrap around the injured airman and stabilize him during removal from the aircraft. Flexible medical litter made of bamboo being used to remove an injured airman from a B-17. When possible men were given some free time in the form of a day off, a pass, or leave. Time off was a great morale booster among the troops. SSgt Houlihan’s day off was Monday. He tells the story of one day riding along to Belfast, Ireland, on a B-17 doing a “whiskey run” for an upcoming party on Thurleigh. 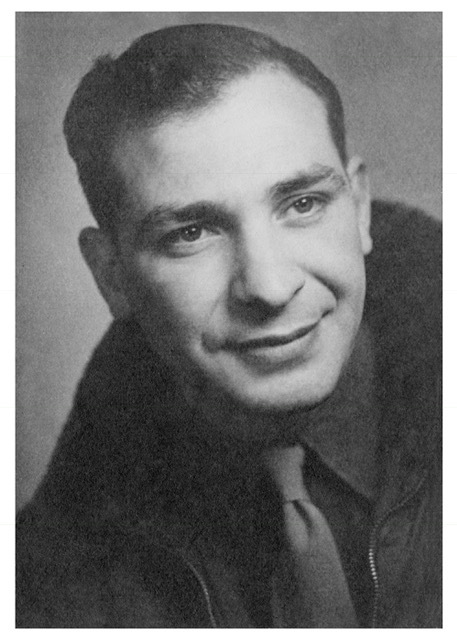 367th BS pilot Capt George R. Buckey was flying that day, and Bill’s friend TSgt Harry Brown was the radio operator. Once in Belfast, Bill and Harry decided to take a tour of Old Bushmills Distillery while the B-17 was being loaded. Capt Buckey told them to be back at the airfield by 5 pm because he wanted to take off in daylight. Bill says that at the end of every whiskey production line at Old Bushmills Distillery he and Harry were offered a sample of that whiskey. According to Bill they were “well sampled” when they noticed it was already 5 pm. Hurrying back to the Belfast airfield they found Capt Buckey standing on the wing of the B-17 yelling expletives at them. Bill says Capt Buckey never said anything further to him, but Harry told Bill that the pilot continued to “comment” to him on the B-17 radio frequency as they flew back to Thurleigh. But tragedy could come to Thurleigh even from other bases. On October 22, 1944, SSgt Houlihan was standing outside watching a formation of what turned out to be 305th BG B-17s returning from a mission. They were based at Chelveston approximately 15 miles (23 kilometers) from Thurleigh. Near SSgt Houlihan was the Thurleigh base photographer TSgt Francis L. Waugh who was standing on the running board of an ambulance with his camera pointed up at the B-17s. They saw two of the B-17s crash into each other. The crews from both B-17s were killed. Human remains and wreckage from the aircraft rained down from the sky over Thurleigh. 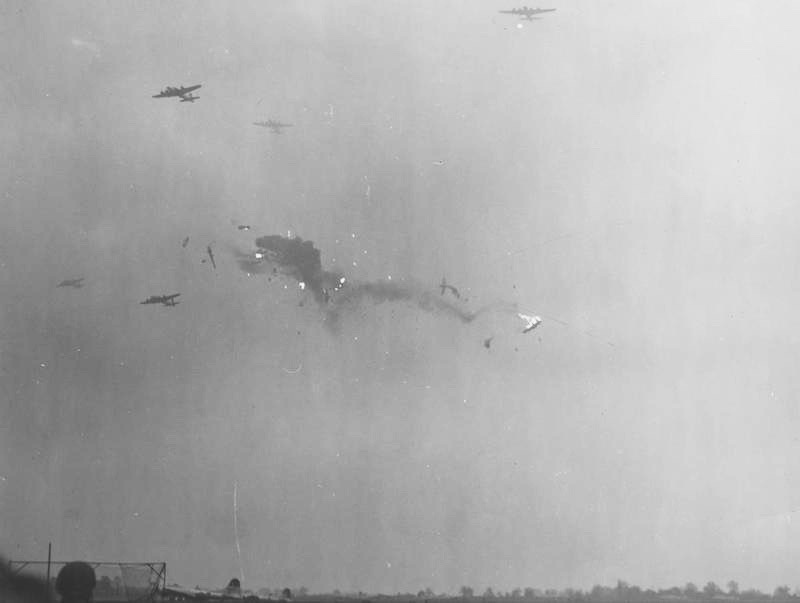 Moment of collision when two 305th BG B-17s crashed over Thurleigh on October 22, 1944. The B-17s altitude over Thurleigh can be observed as one notes visible Thurleigh base landscape in the foreground of the photo. Bill says all Thurleigh base personnel took part in the respectful recovery of the scattered human remains. “It was a murky day in the air on 22 October, and the 306th planes were feeling their way into the field, when suddenly two formations appeared almost out of nowhere. Two of the squadrons from the 305th Bomb Group came over Thurleigh, one from the south and another from the east, searching for the safety of their own field. But there were some happy moments during the war. Bill was the best man at four weddings when American servicemen married English girls. 1944. Bill’s fourth time as best man. 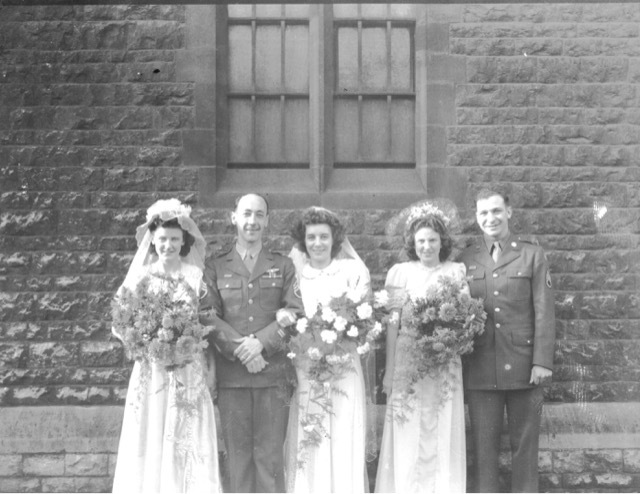 Left to right: Connie Walsh, John Corcoran, bride Mary Corcoran, Evelyn Walsh, and Bill Houlihan. WWII ended officially in Europe on May 8, 1945. The US War Shipping Administration in a plan called Operation Magic Carpet (October 1945 – September 1946) returned eight million Americans back to the US from the European, Pacific, and Asian Theaters. Bill returned to the US on the ship Queen Mary. During WWII SSgt Houlihan “Houlie” saw and experienced many things. He had saved lives as a medic, lost friends in the war, and made many of what would become lifelong friendships. And Bill was one of the men who got to go home. Discharged from the US military in 1945 Bill went back to work with Ford Motor Company. Bill would continue his education using the GI Bill, serve in various defense industry positions, and eventually retire from the US defense industry. On Saint Patrick’s Day in 1946 he met his future wife Ruth Jones. They were married for 67 years. Serving together in wartime can build lifelong friendships. Bill is a member of the Eighth Air Force Historical Society and the 306th BG Historical Association. In 1989 he served as President of the 306th BG Historical Association. He has worked diligently to keep alive the memories of those who served in WWII. I first met Bill Houlihan at a 306th BG Historical Association Reunion in San Antonio, Texas, in 2005. Over the years he has shared many WWII dramatic and humorous stories with me. Bill is one of the people who inspired me to create this WWII website. Thank you Bill for permission to share your stories and photographs. 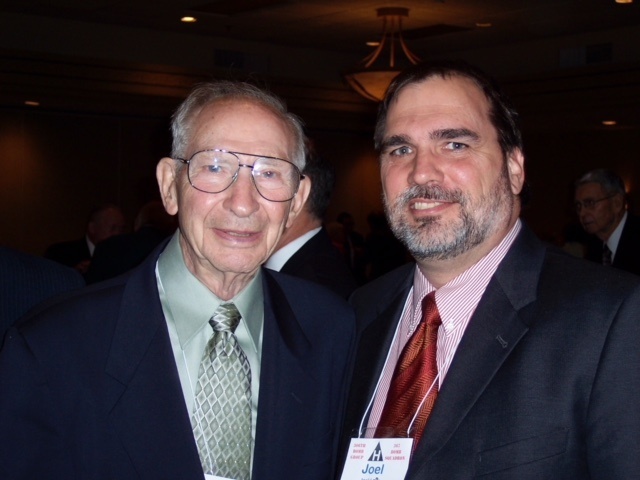 Bill Houlihan with son-in-law Joel LaBo at the 2005 306th BG Reunion in San Antonio, Texas. Thank you to Dr. Vernon Williams, Abilene Christian University History Professor, for access to his WWII East Anglia Air War Project photographs and interview with Bill Houlihan which was conducted in 2005. For more information on the East Anglia Air War Project visit http://www.angliaairwar.org . Thank you to WWII 306th BG Historical Association Historian Cliff Deets. Further information about the WWII 306th BG can be found at http://306bg.us. Another publication mentioning SSgt Houlihan on this website https://www.ww2history.org/war-in-europe/last-flight-of-a-b-17-named-combined-operations-and-emily-harper-rea/ tells the story of a 306th BG B-17 crash on the Isle of Man on April 14, 1945.